FullStory offers the ability to authenticate user logins using Google identity. If your email address is backed by Google apps, you will be able to use this feature. On the FullStory login page, you’ll have the option to log in with Google in lieu of using your email and password. Click Log in with Google. You’ll be redirected to a Google page to choose the correct account. 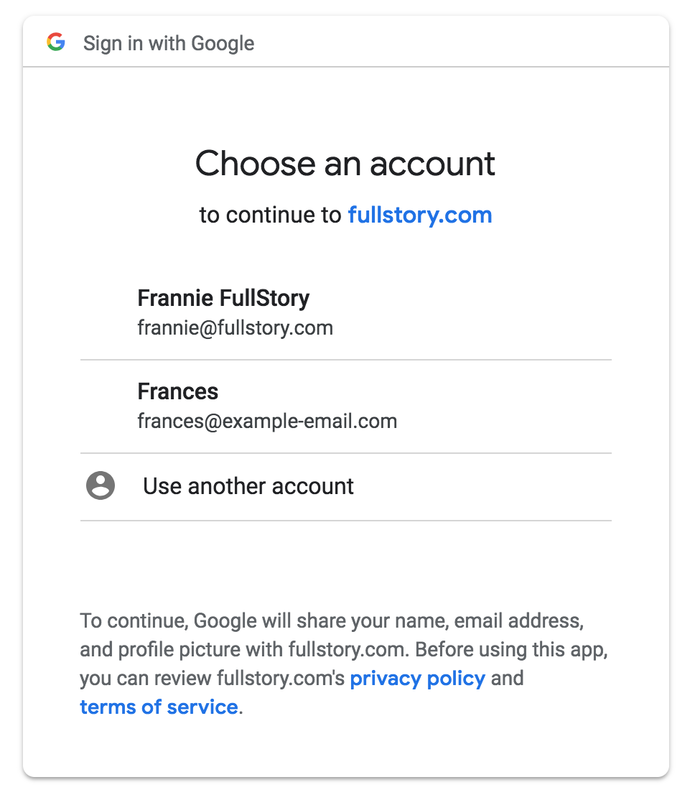 To login, click on the Google account that matches your FullStory account email address. 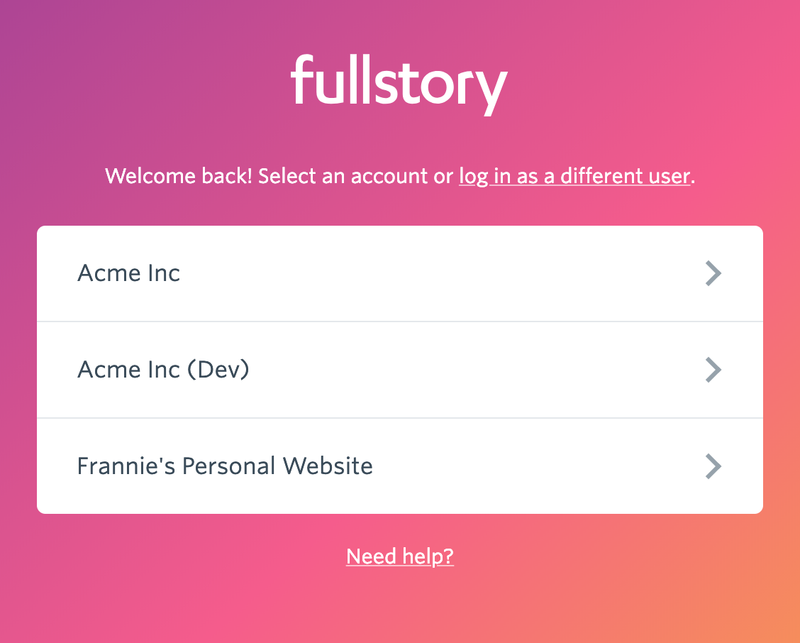 If your email address is associated with multiple FullStory accounts, you will be asked to choose which one you’re signing in to. 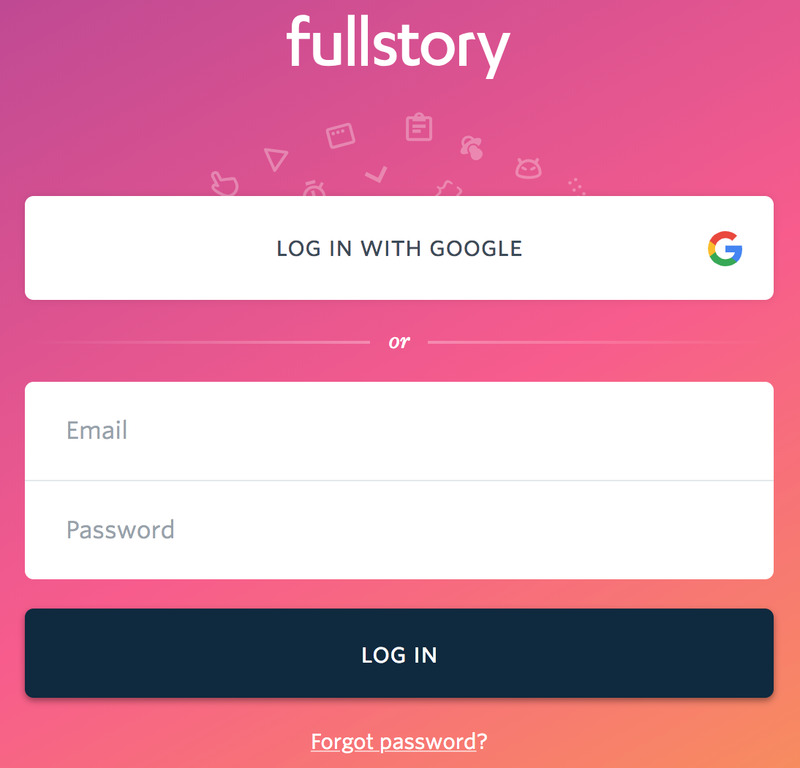 NOTE: If you have access to multiple accounts, then FullStory will tell you which ones require Google authentication when you log in by placing a Google “G” next to it. Can I enforce Google authentication for my account? Yes! Account administrators have the ability to require their team to log in using Google authentication. Enforcing Google authentication means that all of your users must authenticate with Google in order to access FullStory. Once you enforce Google authentication, any users who are currently signed in using a username and password will be automatically logged out and forced to authenticate with Google. You must be an Admin to make this change. Before you can enforce Google authentication, you must be logged in using Google. If you are currently logged in with a username and password, you will be prompted to authenticate with Google before proceeding. Click on Authenticate with Google and follow the login steps to proceed. Toggle the Require Google Authentication for all users slider. All users who are currently logged in will be logged out of FullStory and required to authenticate with Google. All users who are not currently logged in will be required to authenticate with Google on their next visit to FullStory. NOTE: A Google “G” icon is placed next to every user that FullStory believes is part of a Google apps domain. If someone does not have a Google “G” next to their id, then it’s likely that they will not be able to log in to FullStory using that email address. Additionally, users with a plus sign in their email (such as “user+testaccount@xyz.com”) will not be able to authenticate directly to Google. In that case, it is recommended to create a new log-in without the plus sign (such as “user@fullstory.com”). What if I have access to multiple accounts? 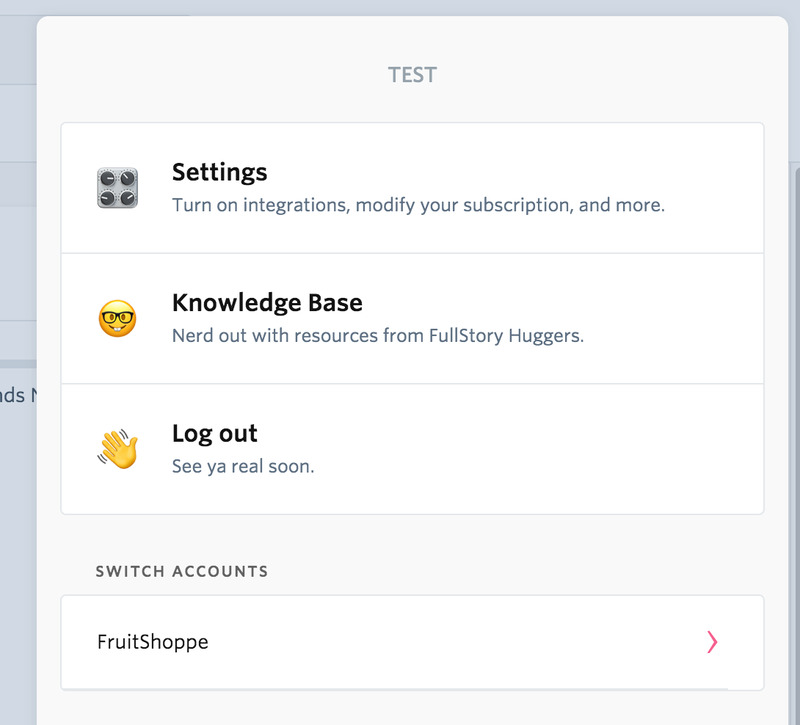 To switch between accounts, click the navigation bar in the top right (Hint - it's the button with your account name) and select the account you which to switch to at the bottom of the tab. When switching between accounts, a check for Google authentication will be made. Accounts that have enforced Google authentication will be indicated with a Google “G” logo next to them.